Looking to the skyline to determine the topographic exposure of a site. This skill is an essential component of the wind throw hazard classification (WHC). Forestry students inspecting a harvester head. An understanding of the machinery and its limitations is essential when planning and managing a commercial harvesting operation. Vole guards supplied by Woodland Heritage being wrapped around each seedling in the oak genetics trial plot. Horse logging is increasingly popular. Both the horse and student are learning the ropes, under instruction from Derrick Byas left). The student in this picture, Chris Seymour, has gone on to establish his own successful contracting business. 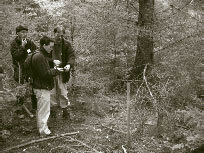 Using a Global Positioning System (GPS) to locate a permanent sample plot in the forest. The GPS is locking in to six or more satellites to direct the forester to this spot. Foresters increasingly call on such technology to monitor forest health and stand conditions. Field trip to a continuous cover forest at Thirlmere, Cumbria. Silviculture students have to consider the stand structure, appropriate conditions for natural regeneration and the full array of forest operations required on this site.